Cole slaw or just slaw is nothing but a salad that consists primarily of cabbage and is dressed with mayonnaise and buttermilk. 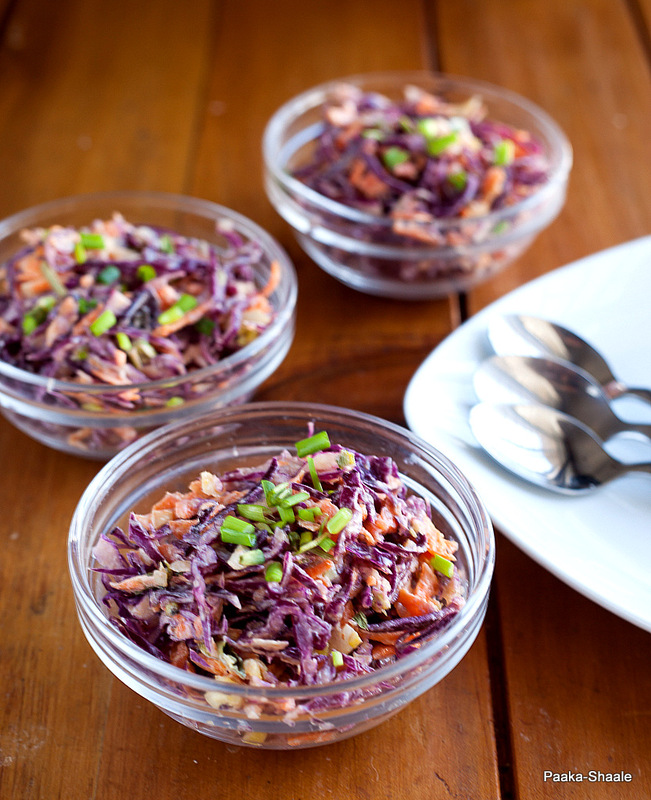 Cole slaw is quintessentially a picnic salad There are a lot of variations to the coleslaw. I have seen recipes that include fruits, cheese, cream cheese, sour cream, seeds etc. This recipe however, is my way of making this traditional slaw. Apart from fruit juices, salads also make regular appearances on our dining table. 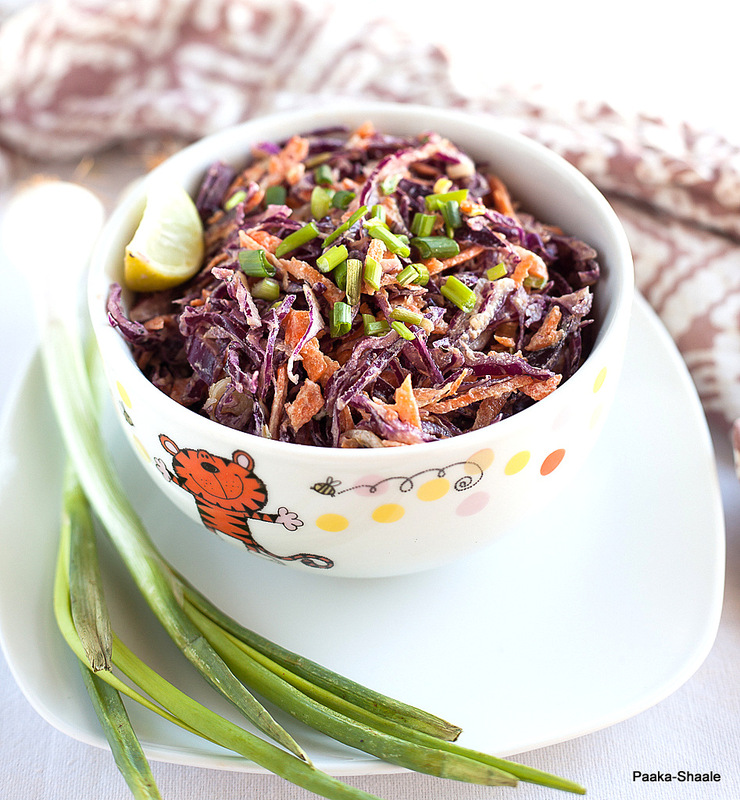 This cabbage salad is something that I make from time to time and we all love it. This salad can be made with white cabbage as well but I love tossing this salad with purple or red cabbage. Simply because of it's vibrant colour. A versatile salad that makes a great side dish with Indian breads or it can be used as a stuffing in wraps and sandwiches. I normally make this salad in the night. That way, I can use the left overs in my sandwich the next day. Cool isn't it? I use hung curd dressing for most of my salads, so healthy and tasty. Love the colour and taste of this cabbage! 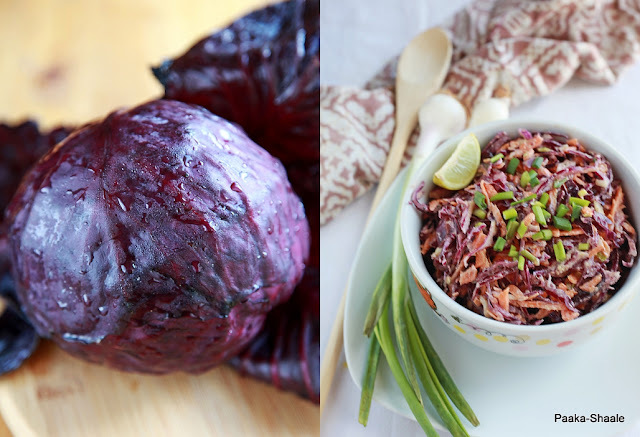 Wish i have this catchy,colourful and definitely crunchy slaw for my lunch rite now. A beautiful and colorful salad! It looks really tasty. This dressing is really original. I am not a huge fan of traditional coleslaw because of the mayo. This looks like a fabulous alternative! Looks amazing.